INDIANAPOLIS -- World-champion professional eater Joey Chestnut didn't set any new records this year - but he did become the five-time champion of the St. Elmo Shrimp Cocktail Eating Championship on Saturday. 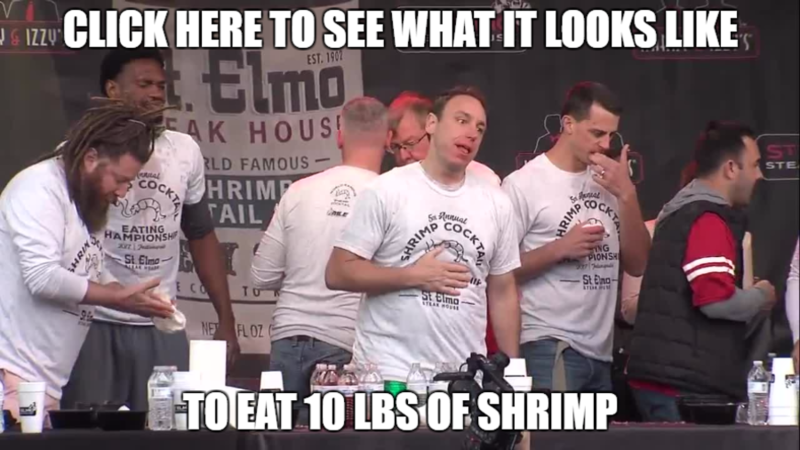 Chestnut is undefeated in the St. Elmo shrimp eating contest and took the 2017 title along with $1,500 after downing 10 pounds 6.4 ounces of St. Elmo shrimp cocktail. This isn’t your ordinary shrimp cocktail eating contest as it features the world famous St. Elmo’s creation, which has been described as one of the spiciest cocktail sauces on the planet by the Travel Channel. In 2015, Chestnut ate over 12 pounds of shrimp cocktail in 8 minutes - he blasted that record in 2016 by eating a whopping 15 pounds of shrimp cocktail. In case you're wondering, that's the equivalent of 45 orders of the world-famous St. Elmo Shrimp Cocktails or 180 pieces of shrimp (not including the spicy sauce).